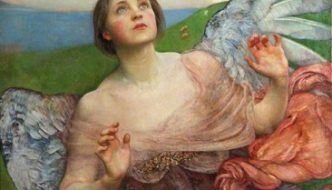 Last Tuesday marked the 100 year anniversary of the first success of the suffrage movement in Britain. On 6 February 1918, some women (specifically those aged 30 and above who either personally, or by marriage, owned property) were granted the right to vote. 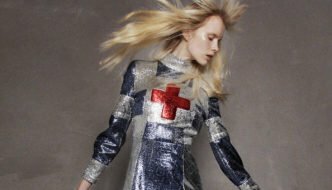 It was not until a decade later that all women received equal voting rights, like men, at the age of 21. Whilst the centenary, celebrated online with the hashtags #suffrage100 and #vote100, is not one of total equality, it commemorates the continued efforts of the suffragettes and the first victory in their lengthy battle for equality. 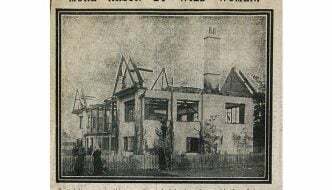 After half a century of unsuccessful peaceful lobbying, the Women’s Social and Political Union (or WSPU) was born in 1903. Famous suffragette, Emmeline Pankhurst, was the founder of this militant organisation, which had women’s suffrage (‘suffrage’ simply means “the right to vote in political elections”) as its sole goal. Reflecting their violent new approach, their motto was ‘Deeds not Words’. This motto was taken as the name for one of the many events that took place across the city last week in celebration and preparation of the anniversary itself. 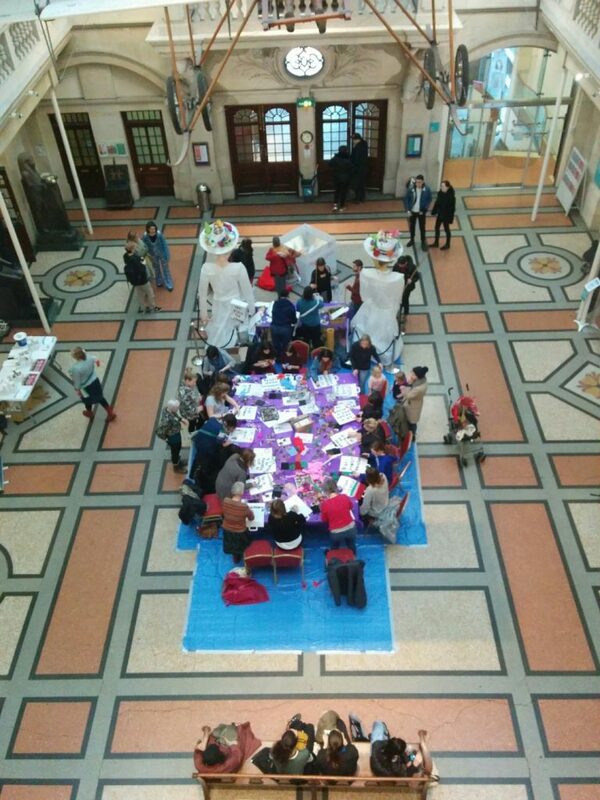 Hosted centrally at Bristol Museum and Art Gallery, Deeds Not Words: Lantern Workshop, was a free event organised by Bristol Women’s Voice and artists from The Lamplighters. The grand lobby of the museum was brought to life with a huge table occupied by women, and allies, in the quiet act of creation. The colours of the suffragette flag (violet for dignity, white for purity, and green for hope) were worn as sashes in the fashion of the suffragist foremothers, but violent action was entirely absent from the family friendly event. The paper lanterns that the attendees came to make were decorated with slogans of hope and equality, and a touch of glitter. Two days later, on the centenary itself, the lanterns, their makers, and many others descended upon the streets. 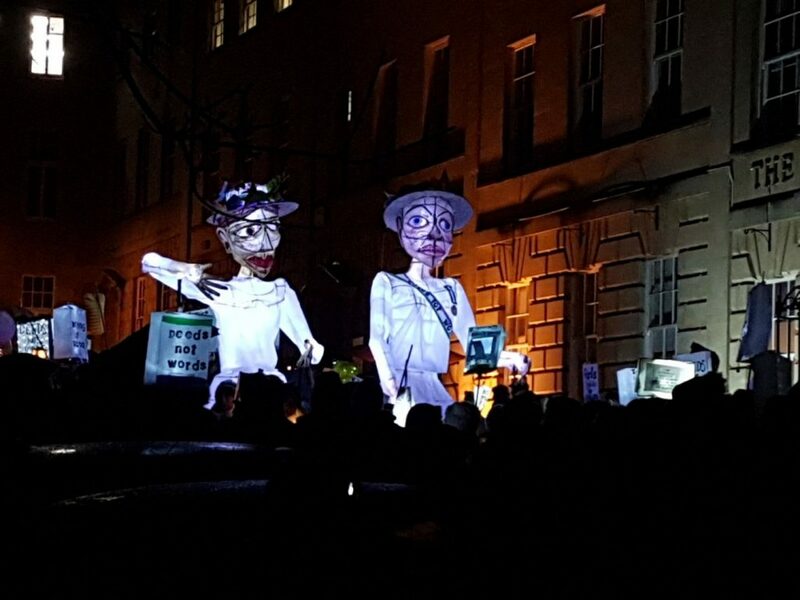 Led by the two giant paper ladies from the museum, the crowd lit up their lanterns and began a procession from Berkeley Square, the former home of Bristol Suffragettes’ HQ. 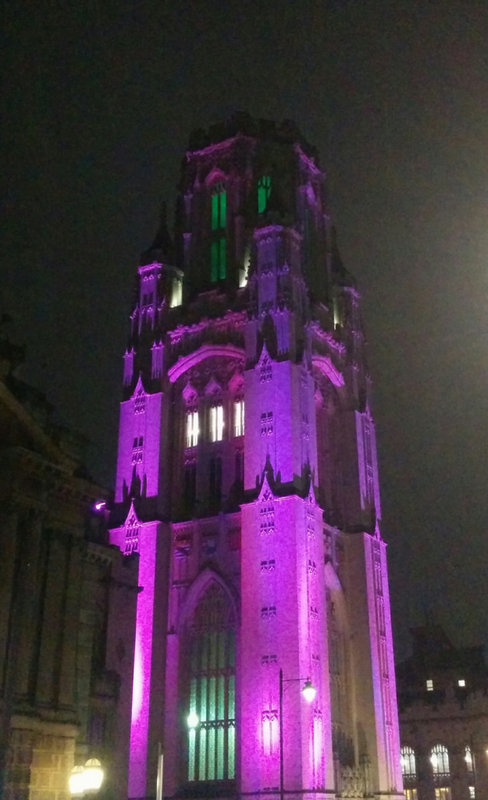 Past Wills Memorial Building, which was respectfully illuminated in suffragette colours, the march continued peacefully to City Hall, for talks, poetry, and a rendition of the WSPU anthem, ‘The March of the Women’, performed by The 100 Voices Girls’ Choir. 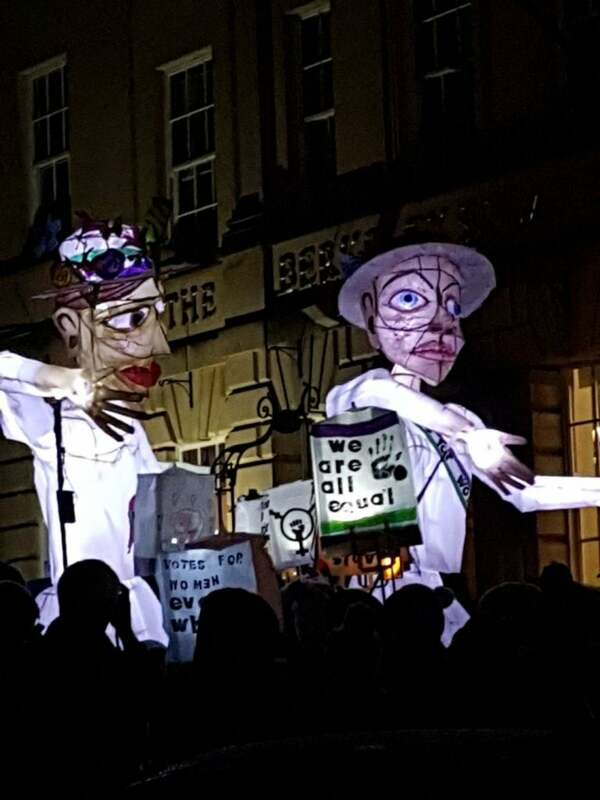 Quite different to the necessarily anarchistic demonstrations of the suffragettes’ time, the mood of The Lantern Parade was predominantly celebratory, with momentary calls to action for the work yet to be done. All the while, the snow fell around the bustling crowd, offering a gentle reminder of the hardships that the suffragettes endured for us 100 years ago.